While the Leaning Tower of Pisa is certainly the most famous tilting tower of Italy (if not world-wide), it is not the only Italian tower that was either intentionally or unintentionally constructed to not stand perpendicular to the ground. 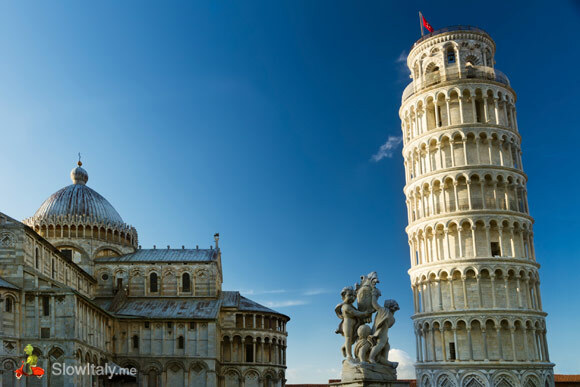 Italy counts at least 10 leaning towers, of which two more are located in Pisa: the Campanile of San Nicola and the Campanile of San Michele degli Scalzi. 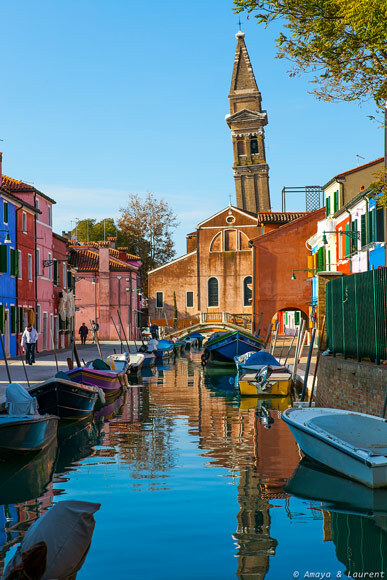 Not surprisingly, Venice, with its unstable soil, also counts three leaning towers. 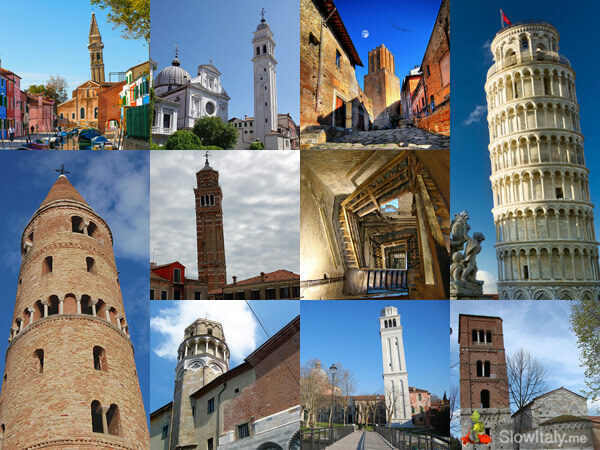 Four other tilting towers can be found in Bologna, Caorle, Burano and Rome. The most famous of all leaning towers is, undoubtedly, the Campanile or Bell Tower of Pisa, located in Piazza dei Miracoli. Construction of the Bell Tower began on August 9, 1173, but the works were interrupted for about a century at about one fourth of the fourth cornice. In the mean-time the tower began to sink due to a poor foundation, set in weak, unstable subsoil. 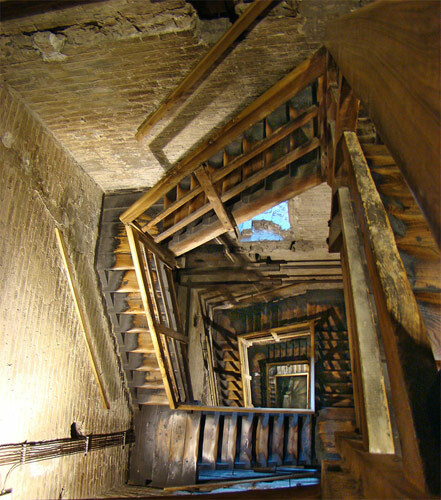 When construction resumed in 1271, engineers built the subsequent floors with one side taller than the other to compensate the tilt that had built up in the mean-time. In 1278, when the seventh cornice had been reached, work was again suspended and only resumed in 1360. Without these two century-long interruptions, which allowed the underlying soil to settle and the design to subsequently be adjusted, the tower would most probably have toppled. The Tower measures 58.36m in height, which appears to be a random number, but which actually corresponds to exactly 100 braccia pisane (Pisan cubits). In Medieval times there was no unity in the metric system and each city-state, Florence, Pisa and Arezzo, had their own metric system with a different value for the braccio and other units. It is from the top of the Leaning Tower that Galileo Galilei supposedly carried out his experiments to prove the Laws of Gravitation. The octagonal bell tower, the second most famous in the city after the Leaning Tower of Pisa is also slightly tilting. Most likely built in 1170, the tower was originally separated from the nearby buildings. The base of the tower is under the current street level. 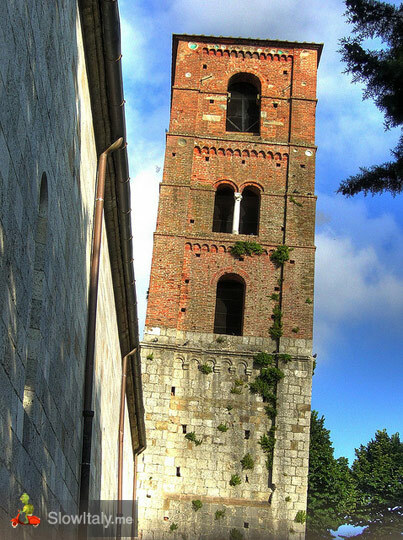 San Michele degli Scalzi Abside e torre campanaria by Samuele Manfrin. 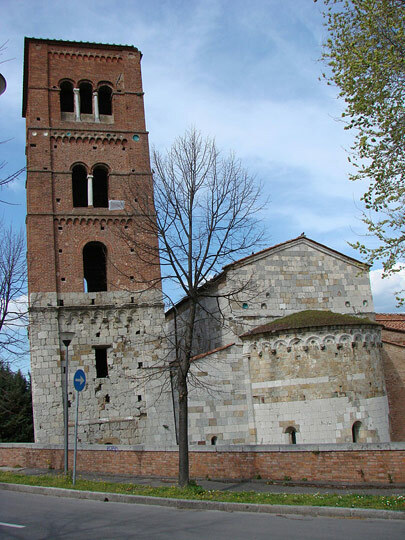 The bell tower of San Michele degli Scalzi stands on the right side of the church, on the side of Viale delle Piagge. The term Scalzi refers to the barefoot monks linked to the church. The quadrangular tower is heavily tilted ( 5% slope ) due to the weak, unstable soil. 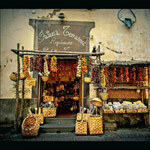 The name of the neighborhood ” Piagge ” stems from the Latin plagae, meaning “low plains, highly prone to flooding”. 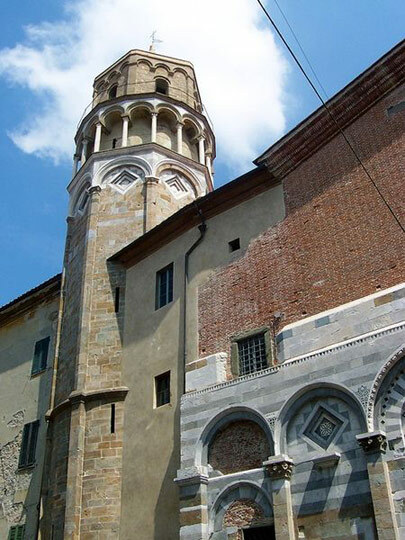 San Michele degli Scalzi, Campanile, Pisa. 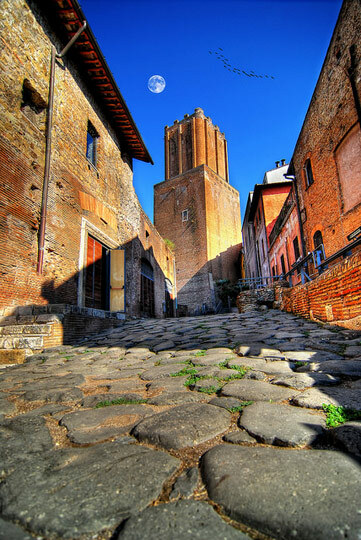 Photo by Giovanni V.
The Asinelli and Garisenda towers of Bologna are located at the intersection of the roads that lead to the five gates of the old ring wall (mura dei torresotti). Asinelli is the taller one while the smaller but more leaning tower is called the Garisenda. 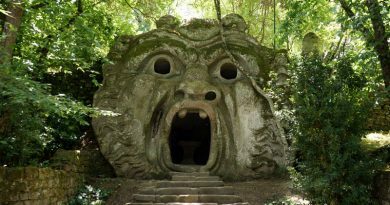 It is believed that they owe their names to the families who commisioned their construction between 1109 and 1119. However, the lack of documents before 1185 make this theory hard to prove. 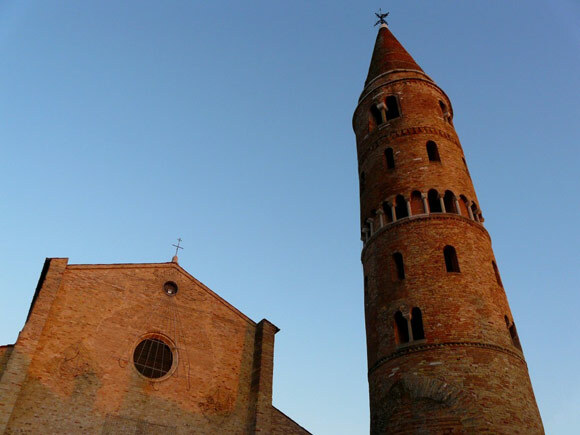 Initially, the two towers were approximately the same height, but the Asinelli tower was later raised to the current 97.2m, while the Garisenda tower was lowered in the 14th century when its structure became unstable due to a yielding of the ground. The Campanile, like the Church, are the work of Andrea Tirali. The current church, built in the 16th century, has no facade as its west side borders onto houses. The Bell Tower was built in 1703-1704. 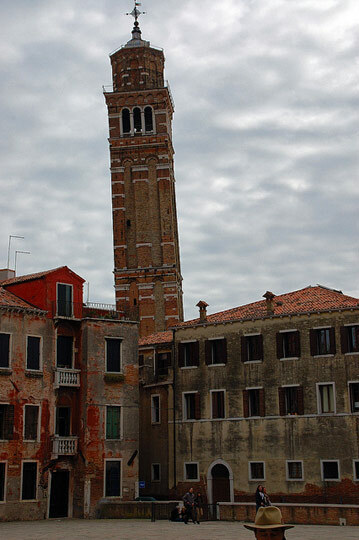 Venice counts three tilting towers, the Campanile of San Giorgio dei Greci, described here, as well as the Campanile of Santo Stefano and the Campanile of San Pietro di Castello, described below. 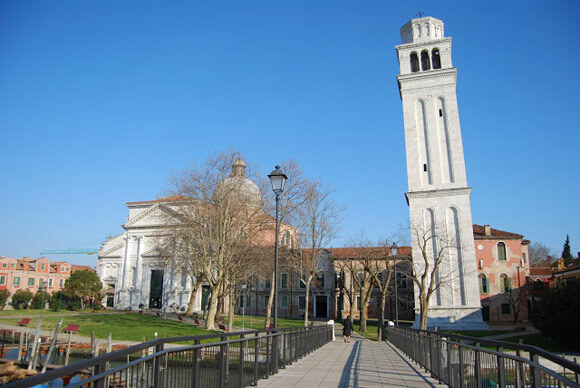 The Campanile of San Giorgio dei Greci was built by Bernardo Ongarin between 1587 and 1592, following a project by Simone Sorella. The Bell Tower started tilting from the beginning of its construction. Its inclination can best be seen from the bridge over the rio dei Greci, close to the Ponte dei Sospiri (Bridge of Sighs). 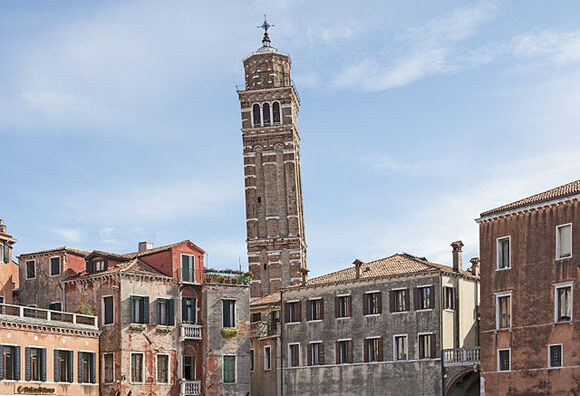 The leaning tower of Santo Stefano (1544) is located in the sestiere San Marco, not far from the Ponte dell’Accademia. 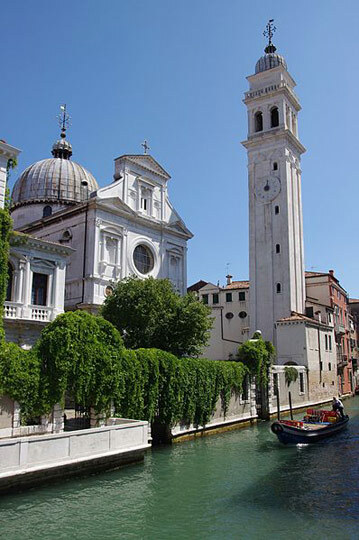 It is one of the highest bell towers of Venice, with a height of 66m. Its inclination is similar to that of the Tower of Pisa, about 2 meters. 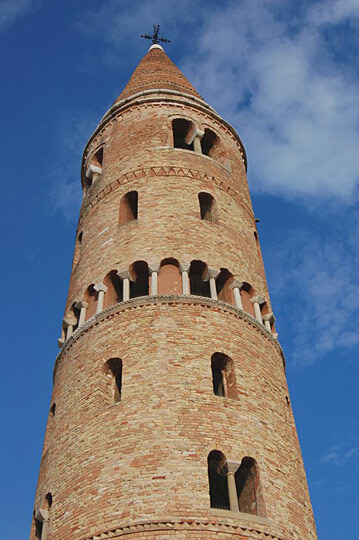 The Campanile of the Cathedral of Santo Stefano in Caorle, close to Venice, is unique in the world, both for its shape and its age. Completed in 1070 AD, the 42 m high bell tower is the oldest surviving example of a cylinder-shaped bell tower with a conic cusp in the world. The Torre delle Milizie (“Tower of the Militia”) is a fortified tower in Rome, also known as Nero’s tower as, according to the legend, it is from here that emperor Nero watched the Great Fire of Rome. However, the actual construction of the tower probably dates to the end of the 1100s and beginning of the 1200s, more precisely from 1198 to 1216. 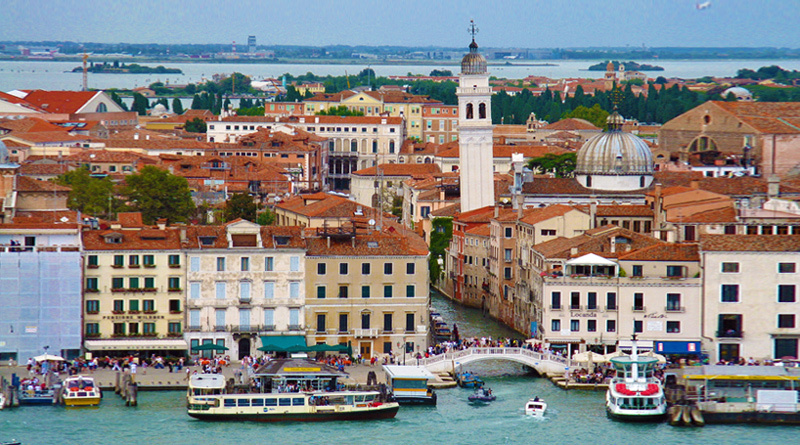 Photo credits (top to bottom): View from the campanile of San Giorgio Maggiore, Venice by Michael Day; Pisa Leaning Tower © fisfra/Istockphoto; Campanile of San Nicola by Geobia; San Michele degli Scalzi Abside e torre campanaria by Samuele Manfrin; San Michele degli Scalzi by Giovanni V.; Andrea Johnston; two towers by Patrick Clenet; inside the Asinelli tower by Tango7174; San Martino by Amaya & Laurent; San Martino by Didier Descouens; Campanile of San Giorgio dei Greci by Jakub Halun; Santo Stefano by Keith Ewing; Campanile of the Basilica of San Pietro di Castello via john-pat-italian-lakes.blogspot.ch; Torre delle Milizie by Riccardo Cuppini; Cathedral and Bell Tower of Caorle by Piave. I was surprised when I recently saw how many leaning towers there are. 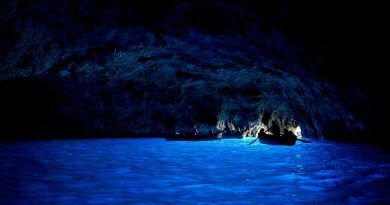 Not only in Italy, but everywhere. The biggest surprise was that even the London’s Big Ben is leaning a bit.